The biggest-ever study of genetics and lung disease is currently underway. Data from as many as 50,000 people in the U.K. will be used to help find out what factors impact each person’s lung health, and why smoking harms some people’s lungs more than others. The study, conducted by the Universities of Nottingham and Leicester, will try to determine why some people are genetically at greater risk of lung disease, in particular, chronic obstructive pulmonary disease (COPD). COPD is a major cause of death, blending chronic bronchitis and emphysema. Cigarette smoking has been identified as its main cause. According to the World Health Organization, COPD is the fourth-leading cause of death in the world. Because it is still increasing in its number of victims, COPD may rise to No. 3, behind cancer and heart disease. The study was launched on November 14, which is also World COPD Day. The researchers are attempting to pinpoint genes that affect lung function, and the ones that affect the likelihood of contracting lung disease. It is also expected to determine if genes have any effect on lung health for smokers and non-smokers. And, it is also expected to determine which genes, if any, contribute to someone becoming addicted to nicotine. The study will utilize the UK Biobank, the world’s biggest genetic reservoir. UK Biobank participants had their lung function measured, and information on smoking habits collected. From these half-million people, researchers will select 50,000 people to search for genetic links that make them susceptible to COPD. They will examine the difference in the cells of heavy smokers and never-smokers. This study is a landmark because there is little data about why lung health is so variable among people, even among smokers. Genetics has been raised as one strong possibility. And, the results of this study may help lead to specific treatments for people who are most at risk—and thus help prevent early deaths. There is no cure for COPD, and it is a very difficult disease to live with. There are, however, some steps people with COPD can take to make life easier. 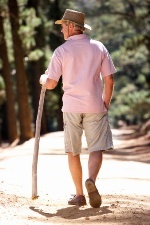 Walking to build lung strength helps, but people with COPD should not continue walking if they become short of breath. They should avoid frigid air and cigarette smoke. It’s a good idea for them to reduce any form of air pollution (like an open fireplace) in their homes. And, they can also be helped by a healthy diet full of vegetables, fruit, whole grains, fish, and poultry. “World’s largest respiratory genetics study launches on World COPD Day,” University of Nottingham, November 14, 2012.